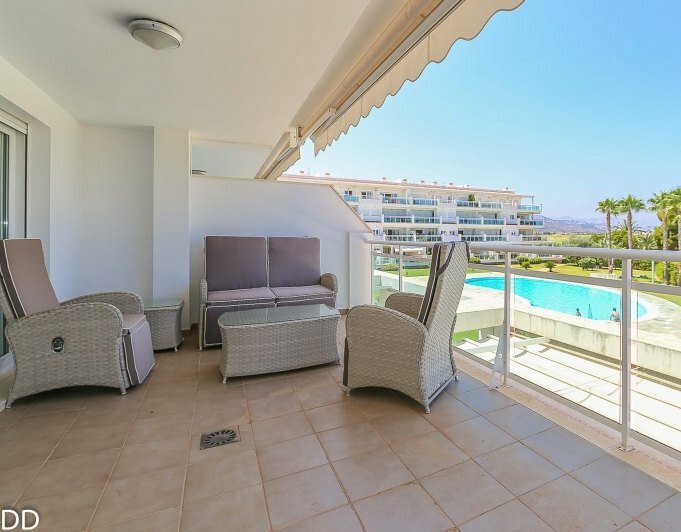 First floor apartment distributed in 2 bedrooms, 2 bathrooms, separate kitchen, living room and terrace.It has a closed garage, elevator, air conditioning and for sale furnished.Complex with swimming pool and garden, on km. 7 of Las Marinas, 1ª line on the beach amd with seaview.. 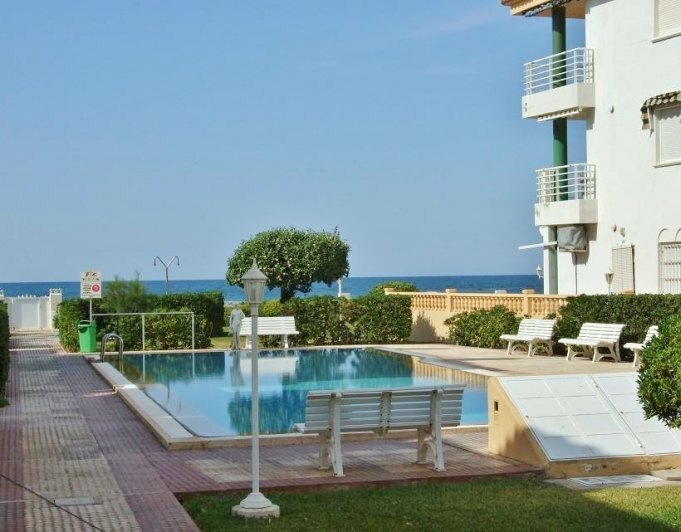 Luxury apartmentfirst line on the beach with direct access to the sea, stone beach and water crystal, quiet area just 9 km from the Centre of Denia. Next to there is a supermarket, bus stop, green area with a small playgroundarea, one of the best restaurants in the area "El Tresmall" offering fresh fish, good rice dishes and a wide variety of dishes from Denia. 10 min frrom there there is a shopping center, Veterinary Clinic and other services. The apartment is located on 1st floor with elevator that descends to the basement parking place. There are no stairs to climb so ot is suitable for people with reduced mobility. This appartment is impeccable, renovated with luxury detail, well equipped and ready to move into. It has airco with heat pump, electrical appliances of high range, screens in the bathrooms, the gallery is closed, the terrace has awning, and the furniture and lighting of very good quality. The terrace is wide to be comfortable with the whole family and it has views towards the Montgo, common areas and the sea. The complex is equipped with swimming pool, track paddle, garden, outdoor showers by the pool and next to the entrance from the beach. It is ideal to spend the months of summer and live comfortably throughout the year. 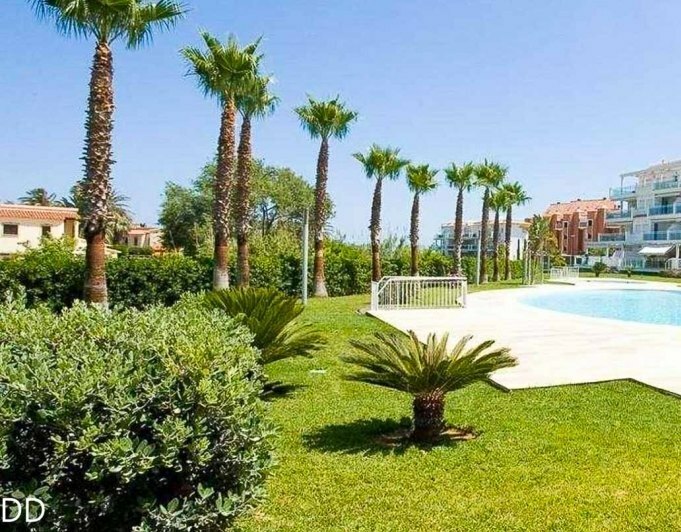 Beautiful apartment located near the yacht club and the centre of Denia in a complex with swimming pool. 2nd floor with elevator, it consists of entrance, 2 bedrooms with fitted wardrobes, 2 bathrooms (one with shower and the other one with bathtub), separate equipped kitchen, dining room, covered terrace with unobstructed views and a little bit of sea view. The terrace is accessed both from the living room and master bedroom.The house is very bright and in perfect condition. It is equipped with air conditioning (split) in the lounge and preinstallation for air conditioning by ducts. It is offer furnished and with appliances. There is also a storage room on the terrace and an underground parking place is included in the price. Ideal both for holidays and live throughout the year. This complex is located first line on the beach with direct access to the sea, quiet area just 9 km from the centre of Denia. Next to there is supermarket, bus stop, green area with a small playground, one of the best restaurants in the area "El Tresmall" offering fresh fish, good rice dishes and wide variety of dishes from Denia. 10 min away there is a shopping center, veterinary Clinic and other services. 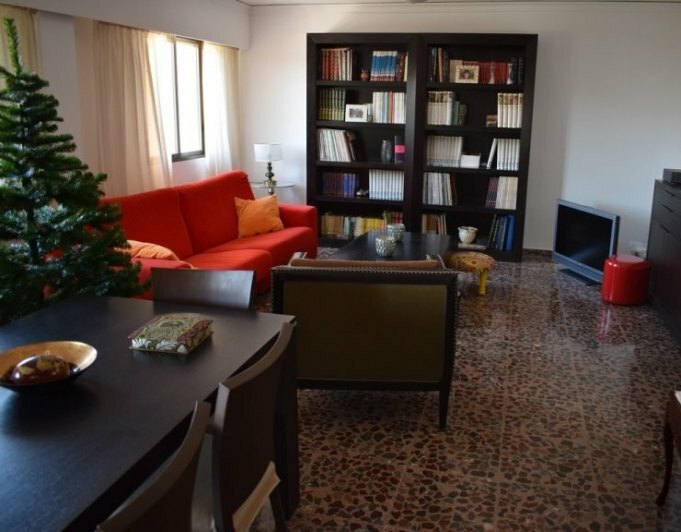 The apartment is located on the 1st floor with elevator that descends to the floor garage from where there are no stairs to climb, and suitable for people with reduced mobility. This impeccable housing, renovated with luxury detail, well equipped and ready to move into. It has aircon with heat pump, electrical appliances of high range, screens in the bathrooms, an enclosed gallery, the terrace has awning, furniture and lighting of very good quality. The terrace is wide to be comfortable with the whole family, has views towards the Montgo, the common areas and the sea. The complex is equipped with swimming pools, track paddle, garden, outdoor showers by the pool and next to the entrance from the beach. It is ideal to spend the months of summer and live comfortably throughout the year.